So How long is it that we’ve known each other? Look – I know it’s not possible – well, we shouldn’t try is what I mean – to quantify how valuable it’s been Mmm. But if you could divide the length of time by that accrued value, then you could get a standard unit. We’d be able to see – measure – whether its been worth it or not. But, as I say, I guess we shouldn’t try. No. It’s a fair point. How do you feel about these meetings then? That’s it though, isn’t it? I don’t want to have to rely on feelings. Feelings are so unreliable, aren’t they? I mean – there are several respectable branches of medicine that have prospered because of that very premise. The law also prospers because feelings are unreliable. The law has a symbiotic relationship with forensic psychology. The alchemy of guilt – turning feelings into fact. Is that an admission then? If it were, there’d be an admission charge. Then I’d certainly need to know if it’s been worth it, wouldn’t I? The price of admission, yeah? Twenty years, more or less. That’s how long we’ve known each other. Not at all. I’m answering your question. Scroll back and you’ll see. Okay. Well then. Do you feel, think, know – whatever – that it’s been worth it? Certainly I do. The actuaries and the clinicians tell me – it is their considered opinion – that I have many good years in front of me. So the proportion of time spent to time available at the rate of return – the standard unit you mentioned – is favourable, A broker would describe it as attractive. Whereas in your case, well, the rate of return would have that same broker on the phone screaming, ‘sell, sell, sell!‘. Are you telling me that I ought to take a negative view of these meetings? That they’re worth more to you than they are to me? Now you scroll back. Mostly, you answer my questions with questions of your own, don’t you? Are you beyond being accountable then? Over these many years has your sense of entitlement grown to the point where all interrogative statements, shot like a bolt from that crossbow of a mouth, must be rewarded by the perfectly divided apple of a response? 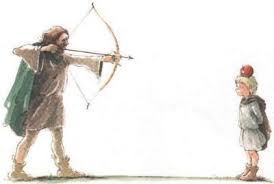 Are you now the William Tell of rhetoric? Is it really twenty years? This entry was posted in Fiction, Literature. Bookmark the permalink.